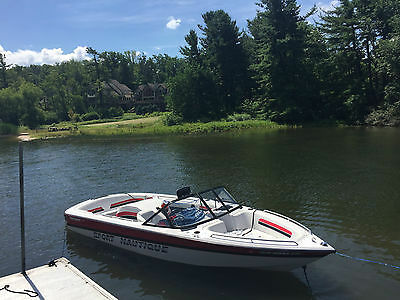 2005 Skeeter ZX 225 Pro Top Of the Line Bass Boat, Yamaha 225 w/Hot Foot! 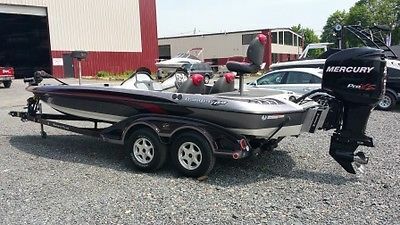 2007 Ranger Z21 Comanche Fiberglass Bass Boat. 123 Hours. Mercury 250 ProXS. 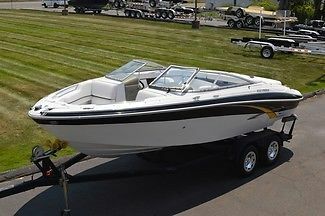 Pre-Owned 2007 Ranger Z21 Comanche Fiberglass Bass Boat. 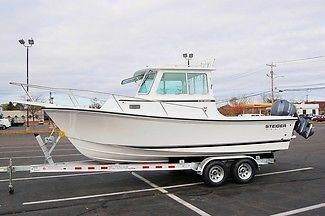 Boat Length: 21’ 2” Outboard: 2007 Mercury 250 Pro XS Boat Width/Beam: 95” Total Boat Weight: 1900lbs. Max Persons: 5 or 800lbs. Engine Hours: 123 Fuel Capacity: 48 gallons. (2) 24 gallon tanks. Trailer: Matching 2007 Ranger Bunk Trailer Equipment and Options Included: Dual console with passenger side console storage 4 batteries load tested and in good condition Pro Charging Systems 4 bank battery charger Minn Kota Maxxum Pro US2, 101, 36v trolling motor Console mounted Lowrance LMS332c sonar/GPS unit Bow mounted Lowrance LMS332c sonar/GPS unit 6 foot Hamby’s keel protector Mercury Smart Craft digital gauge in console Pro Trim lever on steering helm 10” fixed set back plate Recessed trolling motor foot pedal Dual bilge pumps with auto float Dual aerated live wells Bike style leaning seat with pro pole Fold down fishing seat with pro pole Navigation lights Fire extinguisher Deluxe Ranger Boat Cover with detachable motor cover Ranger Trailer with disc brakes, swing away tongue, Spare tire, and retractable transom straps. Boat Serial Number: RNG03062L607 Trailer Serial Number: 4WRBS222671116094 Mercury Serial Number: 1B447058 Boat and Service History: Boat, trailer, motor and equipment package is being sold through our dealership. Prior to listing the boat was lake tested to ensure correct operation of all items and all services have been completed on boat, motor and trailer. Boat has been thoroughly checked out by our service department to ensure all items are in good working condition. A complete tune up service on the Mercury motor was performed by our service department (filters, spark plugs, gear oil, greased, timing and compression checked, etc). A Mercury 3blade Tempest Plus factory spec stainless steel propeller is installed. Our service department also performed a complete wheel bearing service on the Ranger Trailer. Including bearings and brake inspection, new seals and races and brake fluid flushed. All working lights on trailer and tires are in good towing condition. Areas of note: Port side trailer fender has a surface scratch. Starboard side middle of boat hull has a surface scratch. Small chip and scratch in gel coat above were bow roller rests. Right next to the bilge plug a chip was filled in with gel coat putty. The 4 bank battery charger has a slight crack in the first bank window (battery charger is fully functionally and working. All described areas are pictured in the listing to ensure an accurate representation. BOAT, MOTOR, TRAILER AND EQUIPMENT PACKAGE IS BEING SOLD AS IS. NO WARRANTY. 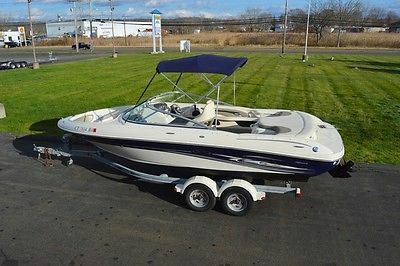 NORTH JERSEY MARINE’S PRE-OWNED GUARANTEE: ALL EQUIPMENT ON BOAT, MOTOR AND TRAILER IS IN GOOD WORKING CONDITION AND HAS BEEN ACCURATELY REPRESENTED IN THIS LISTING. CONTACT 570-460-6520 FOR MORE INFO RELATED TO THIS LISTING. AT TIME OF DELIVERY WE WILL DO A COMPLETE DEMONSTRATION ON THE OPERATION OF THE BOAT, MOTOR, AND TRAILER AT OUR SERVICE FACILITY! SHIPPING AND DELIVERY OPTIONS ARE AVAILABLE. PLEASE CONTACT US FOR QUOTES. PLEASE, SERIOUS INQUIRES ONLY. OUR DISCLAIMER: A $500 DOLLAR DEPOSIT IS REQUIRED THROUGH PAYPAL ONLY WITHIN 1 DAY OF AUCTION CLOSE OR COMMITMENT TO PURCHASE. PAYMENT IN FULL IS REQUIRED WITHIN 7 BUSINESS DAYS OF COMMITMENT TO PURCHASE. FOR NEW JERSEY RESIDENTS ONLY, A STATE OF NEW JERSEY 7 PERCENT SALES TAX WILL BE APPLIED TO FINAL SELLING PRICE. IF PURCHASING REQUIRES FINANCING, PLEASE HAVE PRE-APPROVAL OR FUNDS BEFORE BIDDING. PREFERRED METHODS OF PAYMENT ARE CERTIFIED BANK CHECK OR BANK WIRE TRANSFER. WHEN PAYING WITH CERTIFIED BANK CHECK OR BANK WIRE TRANSFER, PAYMENT IN FULL IS REQUIRED BEFORE ITEM PICK-UP. PLEASE ALLOW NORMAL PROCESSING TIME FOR PAYMENT TO CLEAR BEFORE ITEM PICK-UP WHEN PAYING VIA BANK CHECK. PLEASE ALLOW UP TO 2 BUSINESS DAYS BEFORE BOAT PICK-UP WHEN PAYING VIA WIRE TRANSFER. AFTER COMPLETING THE INITIAL $500 DOLLAR PAY PAL DEPOSIT THE REMAINING BALANCE CAN BE PAYED USING CASH IN PERSON UPON PICK UP. AFTER PAYING THE DEPOSIT AMOUNT PLEASE CALL OR PROVIDE US WITH YOUR CONTACT INFO TO SCHEDULE BOAT PICK-UP. PLEASE ONLY BID ON OUR LISTINGS IF YOU ARE AN EXPERIENCED EBAYER AND ARE FAMILIAR WITH THEIR POLICIES AND HAVE COMPLETED AT LEAST 1 POSITIVE TRANSACTION WITH THE LAST 6 MONTHS. UP UNTIL THERE IS AN INITIAL BID OR COMMITMENT TO PURCHASE, WE HAVE THE RIGHT TO END THE LISTING EARLY. ONCE THERE IS A BID PLACED ON THE LISTING, THE AUCTION WILL LAST ITS DURATION. SATISFACTION GUARANTEED! THANK YOU AND WE APPRECIATE YOUR BUSINESS! 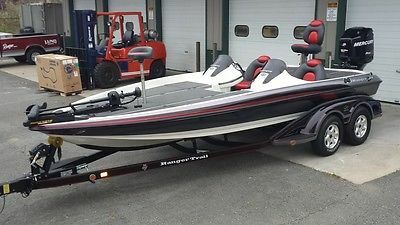 2007 Ranger Z21 Comanche Fiberglass Bass Boat Package. Low Hours! 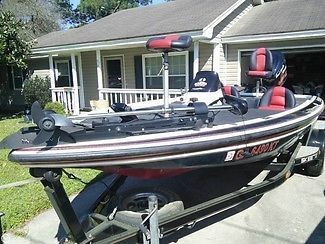 Pre-Owned 2007 Ranger Z21 Comanche Fiberglass Bass Boat. 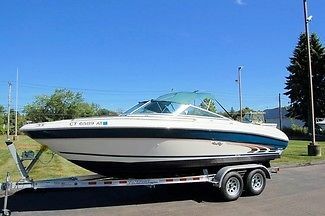 Boat Length: 21’ 2” Outboard: 2007 Mercury 250 Pro XS Boat Width/Beam: 95” Total Boat Weight: 1900lbs. Max Persons: 5 or 800lbs. Engine Hours: 123 Fuel Capacity: 48 gallons. (2) 24 gallon tanks. Trailer: Matching 2007 Ranger Bunk Trailer Equipment and Options Included: Dual console with passenger side console storage 4 batteries load tested and in good condition Pro Charging Systems 4 bank battery charger Minn Kota Maxxum Pro US2, 101, 36v trolling motor Console mounted Lowrance LMS332c sonar/GPS unit Bow mounted Lowrance LMS332c sonar/GPS unit 6 foot Hamby’s keel protector Mercury Smart Craft digital gauge in console Pro Trim lever on steering helm 10” fixed set back plate Recessed trolling motor foot pedal Dual bilge pumps with auto float Dual aerated live wells Bike style leaning seat with pro pole Fold down fishing seat with pro pole Navigation lights Fire extinguisher Deluxe Ranger Boat Cover with detachable motor cover Ranger Trailer with disc brakes, swing away tongue, Spare tire, and retractable transom straps. 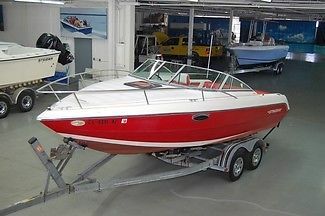 Boat Serial Number: RNG03062L607 Trailer Serial Number: 4WRBS222671116094 Mercury Serial Number: 1B447058 Boat and Service History: Boat, trailer, motor and equipment package is being sold through our dealership. Prior to listing the boat was lake tested to ensure correct operation of all items and all services have been completed on boat, motor and trailer. Boat has been thoroughly checked out by our service department to ensure all items are in good working condition. A complete tune up service on the Mercury motor was performed by our service department (filters, spark plugs, gear oil, fitting greased, timing and compression checked, etc). A Mercury 3blade Tempest Plus factory spec stainless steel propeller is installed. Our service department also performed a complete wheel bearing service on the Ranger Trailer. Including bearing and brake inspection, new seals and races and brake fluid flushed. All working lights on trailer and tires are in good towing condition. Areas of note: Port side trailer fender has 2 spider cracks. Starboard side middle of boat hull has a surface scratch. Small chip and scratch in gel coat above were bow roller rests. All described areas are pictured in the listing to ensure an accurate representation. 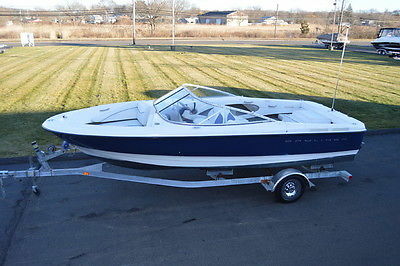 BOAT, MOTOR, TRAILER AND EQUIPMENT PACKAGE IS BEING SOLD AS IS. NO WARRANTY. 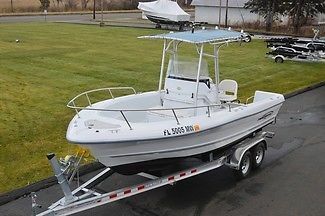 NORTH JERSEY MARINE’S PRE-OWNED GUARANTEE: ALL EQUIPMENT ON BOAT, MOTOR AND TRAILER IS IN GOOD WORKING CONDITION AND HAS BEEN ACCURATELY REPRESENTED IN THIS LISTING. CONTACT 973-770-0400 EXT.103 FOR MORE INFO RELATED TO THIS LISTING. AT TIME OF DELIVERY WE WILL DO A COMPLETE DEMONSTRATION ON THE OPERATION OF THE BOAT, MOTOR, AND TRAILER AT OUR SERVICE FACILITY! SHIPPING AND DELIVERY OPTIONS ARE AVAILABLE. PLEASE CONTACT US FOR QUOTES. PLEASE, SERIOUS INQUIRES ONLY. OUR DISCLAIMER: A $500 DOLLAR DEPOSIT IS REQUIRED THROUGH PAYPAL ONLY WITHIN 1 DAY OF AUCTION CLOSE OR COMMITMENT TO PURCHASE. PAYMENT IN FULL IS REQUIRED WITHIN 7 BUSINESS DAYS OF COMMITMENT TO PURCHASE. FOR NEW JERSEY RESIDENTS ONLY, A STATE OF NEW JERSEY 7 PERCENT SALES TAX WILL BE APPLIED TO FINAL SELLING PRICE. IF PURCHASING REQUIRES FINANCING, PLEASE HAVE PRE-APPROVAL OR FUNDS BEFORE BIDDING. PERFERRED METHODS OF PAYMENT ARE CERTIFIED BANK CHECK OR BANK WIRE TRANSFER. WHEN PAYING WITH CERTIFIED BANK CHECK OR BANK WIRE TRANSFER, PAYMENT IN FULL IS REQUIRED BEFORE ITEM PICK-UP. PLEASE ALLOW NORMAL PROCESSING TIME FOR PAYMENT TO CLEAR BEFORE ITEM PICK-UP WHEN PAYING VIA BANK CHECK. PLEASE ALLOW UP TO 2 BUSINESS DAYS BEFORE BOAT PICK-UP WHEN PAYING VIA WIRE TRANSFER. AFTER COMPLETING THE INITIAL $500 DOLLAR PAY PAL DEPOSIT THE REMAINING BALANCE CAN BE PAYED USING CASH IN PERSON UPON PICK UP. AFTER PAYING THE DEPOSIT AMOUNT PLEASE CALL OR PROVIDE US WITH YOUR CONTACT INFO TO SCHEDULE BOAT PICK-UP. PLEASE ONLY BID ON OUR LISTINGS IF YOU ARE AN EXPERIENCED EBAYER AND ARE FAMILIAR WITH THEIR POLICIES AND HAVE COMPLETED ATLEAST 1 POSITIVE TRANSACTION WITH THE LAST 6 MONTHS. UP UNTIL THERE IS AN INTIAL BID OR COMMITMENT TO PURCHASE, WE HAVE THE RIGHT TO END THE LISTING EARLY. ONCE THERE IS A BID PLACED ON THE LISTING, THE AUCTION WILL LAST ITS DURATION. SATISFACTION GUARANTEED! THANK YOU AND WE APPRECIATE YOUR BUSINESS!